General information: Huge array of Belgian beers. 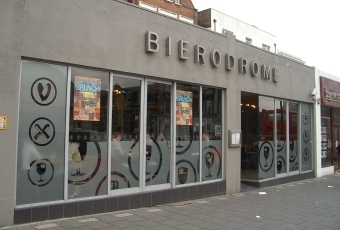 This place is now called Belgo, and is part of a chain that also has bars in Covent Garden, Chalk Farm and Holborn. It is quite popular with the trendy young things of Clapham (and those who aspire and ultimately fail to be, such as myself) with prices to match; A pint of the very reasonable Cristal will set you back �3.75 and be prepared to go much, much higher for the more specialised stuff. Not being a massive aficionado of Belgian Beer I enjoy this place to the extent that it is something a bit different and quite good for people-watching. Most BITE users would find this place completely soulless, however. Very good selectin of beers (that's it main selling point) most of them at a high price. You can see why though as they are pretty specialised. The service is good but does lack atmosphere. Not bad but not great. There is one of the pubs that doesn't attract the 'cool' people of Clapham for some reason and is much better for it. Most of the staff know their beers and provide good advice if you want it. It's not cheap, but well worth having a few warm up beers here.